In today’s competitive retail market, it’s all too easy for your website to get lost in the crowd. But if your website isn’t helping you attract new customers and drive revenue for your business, it’s time to make a change! Localmize specializes in a building custom retailer websites that both look beautiful and are compatible with major search engines to help get your business found by potential customers. Localmize designs, builds and hosts websites for retailers, with outstanding results; Our retail customers rank at or near the top of Google search results for the most relevant industry keywords. Don’t settle for a cheap template that makes your retailing business look just like the competition. For a website that makes you stand out, let the Localmize design team build you a website that is completely unique. We never use templates, because we know that the most effective websites are designed with your unique products, customer base, and service areas in mind. Your website might look pretty, but if no one can find it using major search engines like Google, you can bet that no potential customers are even seeing your site! The Localmize design process uses our team’s extensive experience in marketing and search engine optimization to create websites that rank at the top of search results and help drive web traffic to generate more sales for you. Localmize offers a complete turnkey solution for retailers. 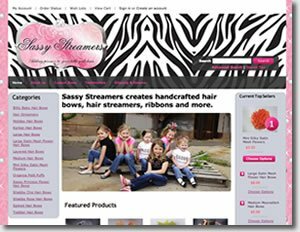 Localmize designed Sassy Streamers’ ecommerce website, adding a wide variety of product pages, product images and more. Their unique aesthetic worked to establish a fun-loving, family-friendly brand for the local business. Interested in our online marketing services for retailers? Take a look at our retailer search engine optimization and FAQ page! Call 877-700-1990 to speak with a Retailer Website Design expert.